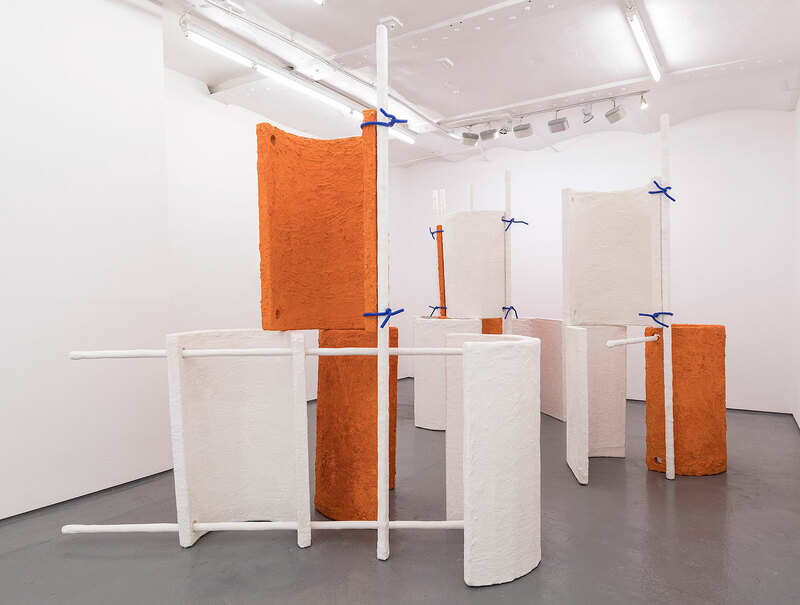 FOLD Gallery is pleased to present an exhibition of new work by Olivia Bax, her first solo presentation in the gallery. 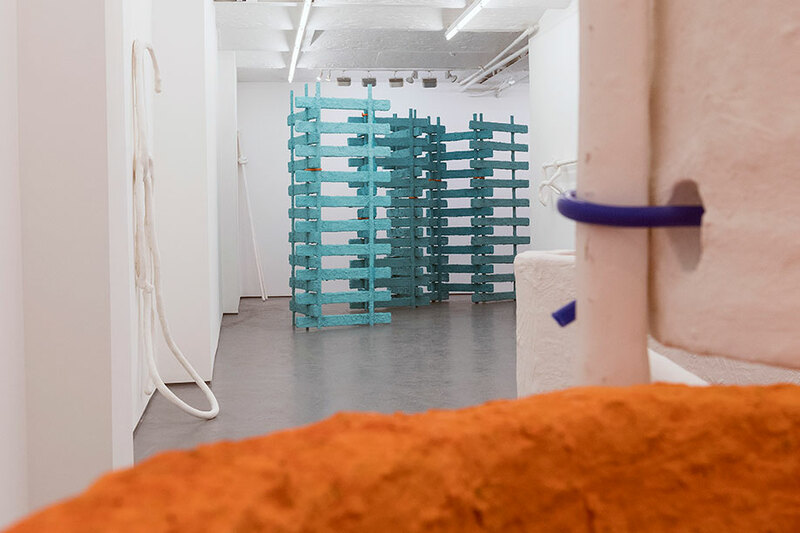 The installation comprises large, coloured sculptures which are interspersed with smaller wall-based objects made in plaster. 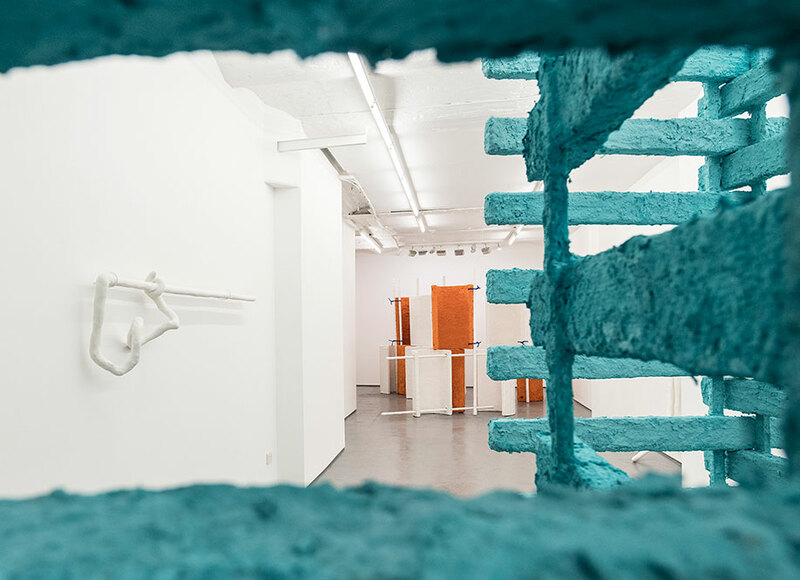 The show is informed by the architecture and the long, thin proportions of the gallery, exploiting and often interrupting the optimal view of its length. 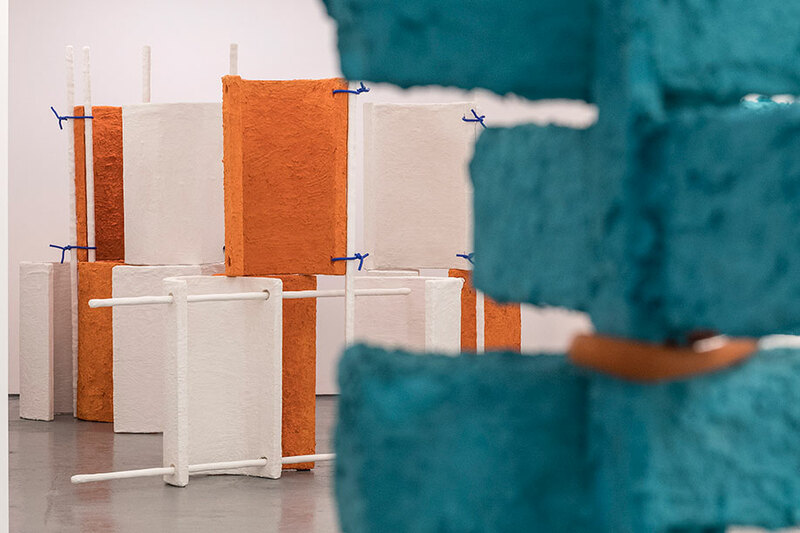 Elemental objects, of curved orange forms and blue fence-like screens, occupy either end of the space. Aspects of the shapes are a reaction to the vaulted ceiling but do not follow a strict rule; they are made from cut strips of polystyrene and put together, almost casually, each one slightly different from the one before. Some of the work invites us into the space it occupies, encouraging the viewer to move amongst it. Other objects behave like barriers, blocking the opportunity to see everything at once, instead forcing the viewer to discover the work at a slower pace. 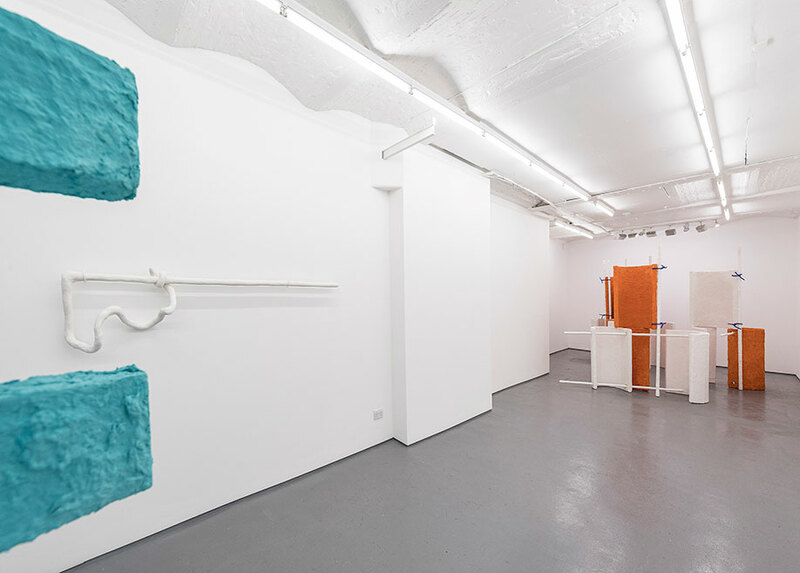 Bax’s coloured pieces are made using a paper shredding machine to shred disused newspapers. She then adds water, paint, glue and plaster. Each mixture involves physical energy to mix a vat of different materials together until they fuse and become a paste. Pressing and squishing the material on to an armature, patterns are then created by the marks from her fingers. The marks are not arbitrary but register necessary actions – as sculpture can evoke feelings as well as encompass the very action employed to make it. Tim Ingold’s book titled Making discusses how instinctive the hand is, growing knowledge through experience and practice. He describes how ‘rhythms are the creators of forms’. The repetition of gesture is not just a mechanical activity – instead it is sensory, embodying a dialogue between the maker and the material. 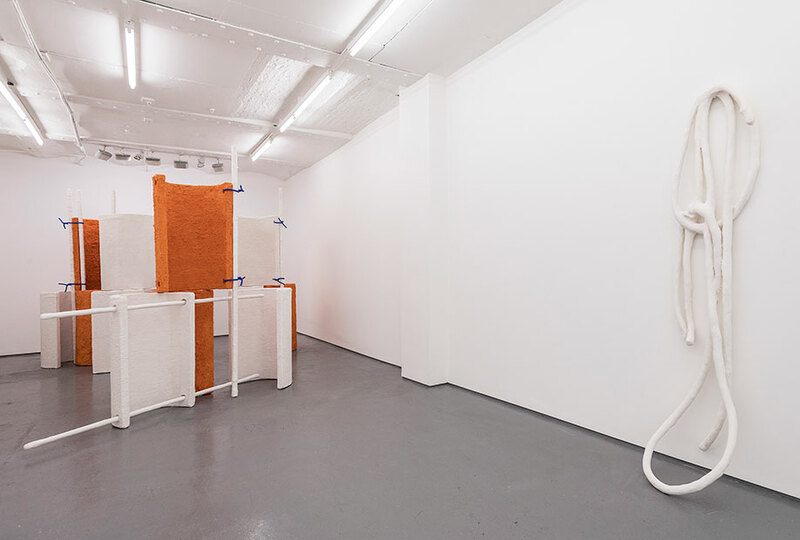 All of the work in the show is configured on site to maintain the energy and freshness from the studio. 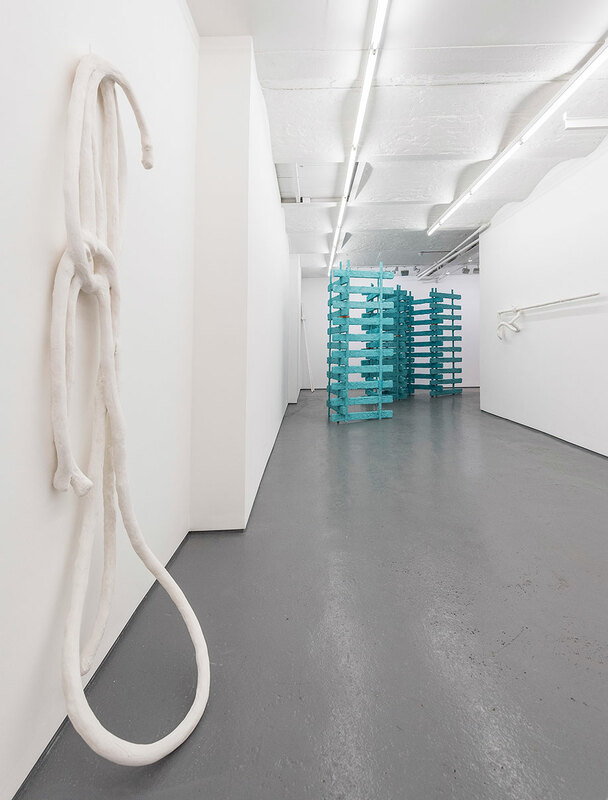 The individual fragments are bound by coloured silicone straps, which act as punctuation marks, highlighting the impermanence of the work – that it can change and modify according to the environment – relying on the space it inhabits to be complete.